Ankara is politically a triple battleground between the ruling conservative Justice and Development Party (AKP), the opposition Kemalist centre-left Republican People's Party (CHP) and the nationalist far-right Nationalist Movement Party (MHP). The province of Ankara is divided into 25 districts. The CHP's key and almost only political stronghold in Ankara lies within the central area of Çankaya, which is the city's most populous district. While the CHP has always gained between 60 and 70% of the vote in Çankaya since 2002, political support elsewhere throughout Ankara is minimal. The high population within Çankaya, as well as Yenimahalle to an extent, has allowed the CHP to take overall second place behind the AKP in both local and general elections, with the MHP a close third, despite the fact that the MHP is politically stronger than the CHP in almost every other district. Overall, the AKP enjoys the most support throughout the city. The electorate of Ankara thus tend to vote in favour of the political right, far more so than the other main cities of Istanbul and İzmir. In retrospect, the 2013–14 protests against the AKP government were particularly strong in Ankara, proving to be fatal on multiple occasions.Melih Gökçek has been the Metropolitan Mayor of Ankara since 1994 as a politician from the Welfare Party. He later joined the Virtue Party and then the AKP. Initially elected in the 1994 local elections, he was re-elected in 1999, 2004 and 2009. In the 2014 local election, Gökçek stood for a fifth term. The MHP metropolitan mayoral candidate for the 2009 local elections, conservative politician Mansur Yavaş, stood as the CHP candidate against Gökçek. In a heavily controversial election, Gökçek was declared the winner by just 1% ahead of Yavaş amid allegations of systematic electoral fraud. With the Supreme Electoral Council and courts rejecting Yavaş's appeals, he has declared intention to take the irregularities to the European Court of Human Rights. Although Gökçek was inaugurated for a fifth term, most election observers believe that Yavaş was the winner of the election. ^ "Turkish Statistical Institute The Results of Address Based Population Registration System 2017". 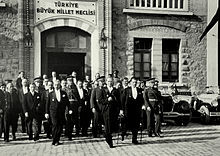 www.turkstat.gov.tr. ^ Berube, Alan; Trujillo, Jesus Leal; Ran, Tao; Parilla, Joseph (22 January 2015). "Global Metro Monitor". Brookings. ^ "Sub-national HDI - Area Database - Global Data Lab". hdi.globaldatalab.org. ^ "Ankara". Collins Dictionary. n.d. Retrieved 24 September 2014. ^ Lord Kinross (1965). Ataturk: A Biography of Mustafa Kemal, Father of Modern Turkey. William Morrow and Company. ^ a b "Turkey: Major cities and provinces". citypopulation.de. Retrieved 8 February 2015. ^ "Municipality of Ankara: Green areas per head". Ankara.bel.tr. Archived from the original on 19 July 2011. Retrieved 29 June 2010. ^ "Judy Turman: Early Christianity in Turkey". Socialscience.tjc.edu. Archived from the original on 15 November 2002. Retrieved 29 June 2010. ^ "Saffet Emre Tonguç: Ankara (Hürriyet Seyahat)". Hurriyet.com.tr. Retrieved 29 June 2010. ^ "Klimatafel von Ankara (Central) / Türkei" (PDF). Baseline climate means (1961–1990) from stations all over the world (in German). Deutscher Wetterdienst. Retrieved 12 January 2019. ^ a b c d e f g h i j k l m n o p q r s t Belke, Klaus (1984). "Ankyra". Tabula Imperii Byzantini, Band 4: Galatien und Lykaonien (in German). Vienna: Verlag der Österreichischen Akademie der Wissenschaften. pp. 126–130. ISBN 978-3-7001-0634-0. ^ "Gezenadam: "Susuz Su Perileri"". GezenAdam. ^ "İnat değil kent kazandı". hurriyet.com.tr. 20 December 2010. ^ a b c Rockwell 1911. ^ FNSS Savunma Sistemleri A.Ş. "FNSS Savunma Sistemleri A.Ş." FNSS Savunma Sistemleri A.Ş. ^ "Nurol Makina ve Sanayi A.Ş." nurolmakina.com.tr. ^ "EGO Genel Müdürlüğü". Ego.gov.tr. Archived from the original on 23 November 2008. Retrieved 5 May 2009. ^ "Largest urban ropeway on Eurasian continent opens to celebrations in Ankara". Leitner ropeways. Archived from the original on 21 May 2014. Retrieved 21 May 2014. ^ "Successful inauguration of Ankara – Istanbul High Speed Line". uic.org. ^ "Ankara Public Transportation Statistics". Global Public Transit Index by Moovit. Retrieved 19 June 2017. Material was copied from this source, which is available under a Creative Commons Attribution 4.0 International License. ^ "Turkish Protester Ethem Sarısülük Is Dead, Family Says [UPDATED]". The Huffington Post. ^ "Turkey's Prime Minister: Erdoğan v. judges, again". The Economist. 411 (8883): 32–36. 19 April 2014. ^ "Turkish opposition party will challenge Ankara vote – Al-Monitor: the Pulse of the Middle East". Al-Monitor. Archived from the original on 21 July 2015. Retrieved 29 October 2014. ^ "Is Something Rotten In Ankara's Mayoral Election? A Very Preliminary Statistical Analysis – Erik Meyersson". Erik Meyersson. ^ Joe Parkinson And Emre Peker (1 April 2014). "Turkish Opposition Cries Vote Fraud Amid Crackdown – WSJ". WSJ. ^ "Turkey's opposition to contest Ankara local poll result, citing election fraud". voiceofrussia.com. ^ "CHP's Ankara candidate vows to defend votes as police crack down on protest – POLITICS". hurriyetdailynews.com. ^ "Turkey's Weirdest Mayor Won't Be Distracted By Electoral Fraud Allegations". VICE News. On the obverse of the 1 lira banknote of 1927–1939 (1. Emission Group – One Turkish Lira – I. Series Archived 17 April 2009 at the Wayback Machine). On the obverse of the 5 lira banknote of 1927–1937 (1. Emission Group – Five Turkish Lira – I. Series Archived 26 April 2009 at the Wayback Machine). On the reverse of the 10 lira banknote of 1927–1938 (1. Emission Group – Ten Turkish Lira – I. Series Archived 26 April 2009 at the Wayback Machine). On the reverse of the 10 lira banknote of 1938–1952 (2. Emission Group – Ten Turkish Lira – I. Series Archived 25 February 2009 at the Wayback Machine). On the reverse of the 100 lira banknotes of 1983–1989 (7. Emission Group – One Hundred Turkish Lira – I. Series Archived 3 June 2009 at the Wayback Machine & II. Series Archived 3 June 2009 at the Wayback Machine). ^ "Roma Yolu". arkitera.com. 14 March 2007. Retrieved 10 June 2013. ^ Sargın, Haluk (2012). Antik Ankara (in Turkish). Ankara: Arkadaş Yayınevi. pp. 126, 127, 128. ISBN 978-975-509-719-0. ^ SonTech Yazılım. ": Hacı Bayram-ı Veli :. hacıbayramveli, hacı bayramveli, haci bayrami veli, hacıbayram, nasihatleri, hacı bayram cami, hayatı, hacıbayram-ı veli". Hacibayramiveli.com. Archived from the original on 25 May 2009. Retrieved 5 May 2009. ^ "Museums – Ankara.com: City guide of Turkey's Capital". Retrieved 8 July 2016. ^ "Eski Han'a yeni çehre: Suluhan/Kent Tarihi/milliyet blog". Retrieved 8 July 2016. ^ Tuncer, Mehmet. "Ankara: ESKİ HAN'A YENİ ÇEHRE : SULUHAN". Retrieved 8 July 2016. ^ "Index of /". Boorkestrasi.com. Archived from the original on 22 March 2007. Retrieved 22 May 2009. ^ Planet, Lonely. "Museum of Anatolian Civilisations – Lonely Planet". Retrieved 8 July 2016. ^ "Ethnography Museum of Ankara – Müze". Retrieved 8 July 2016. ^ "Ankara Art and Sculpture Museum Directorate". Retrieved 8 July 2016. ^ "Turkish Air Force – Air Force Museums – Ankara Aviation Museum". Retrieved 8 July 2016. ^ "Hentbol-Şampiyon kim olacak?". Sports TV (in Turkish). 20 May 2013. Retrieved 29 May 2013. ^ "Angora Rabbit Breeds – How to Care for Your Angora Rabbit". Archived from the original on 25 January 2009. Retrieved 29 January 2009. ^ "Angora Goats history". Daisyshillfarm.com. Archived from the original on 3 July 2009. Retrieved 29 June 2010. ^ "Sister Cities of Ankera". Ankera, Turkey: T.C. Ankara Büyükþehir Belediyesi Baþkanlýðý. Retrieved 13 August 2016. ^ daenet d.o.o. "Sarajevo Official Web Site: Sister cities". Sarajevo.ba. Archived from the original on 12 April 2009. Retrieved 6 May 2009. ^ "Signing Sister City Protocol between Zagreb and Ankara". Ankara Metropolitan Municipality. 27 October 2008. Archived from the original on 29 October 2012. ^ "Frequently Asked Questions – Office of Protocol and International Affairs". District of Columbia. Retrieved 18 September 2012. ^ Bangkok Metropolitan Administration; Greater Ankara Municipality (21 March 2012). "Friendship and cooperation agreement between Bangkok Metropolitan Administration of the Kingdom of Thailand and the Greater Ankara Municipality of the Republic of Turkey" (PDF). ^ "Tehran, Ankara to Sign Sister City Agreement Today". FarsNews. Retrieved 18 December 2013. ^ "Kardeş Kentleri Lists ve 5 Mayıs Avrupa Günü Kutlaması [via WaybackMachine.com]" (in Turkish). Ankara Büyükşehir Belediyesi – Tüm Hakları Saklıdır. Archived from the original on 14 January 2009. Retrieved 21 July 2013. Baynes, T.S., ed. (1878). "Angora" . Encyclopædia Britannica. 2 (9th ed.). New York: Charles Scribner's Sons. p. 45. Chisholm, Hugh, ed. (1911b). "Ancyra" . Encyclopædia Britannica. 1 (11th ed.). Cambridge University Press. p. 953. Parvis, Sarah (2006). Marcellus of Ancyra And the Lost Years of the Arian Controversy 325–345. New York: Oxford University Press. ISBN 978-0-19-928013-1. This article incorporates text from a publication now in the public domain: Chisholm, Hugh, ed. (1911). "Angora" . Encyclopædia Britannica. 2 (11th ed.). Cambridge University Press. pp. 40–41. This article incorporates text from a publication now in the public domain: Rockwell, William Walker (1911). "Ancyra" . In Chisholm, Hugh (ed.). Encyclopædia Britannica. 1 (11th ed.). Cambridge University Press.